Randy has put his love of Tin Pan Alley, Folk, Rock, Blues, Ragtime, Bluegrass, and Broadway music on display many times before. Now, with his 6th not-JUST-for-kids album, Trippin’ Round the Mitten, he adds Hip-hop, Pop, Doo-Wop, and Punk to the list! Randy moved to the suburbs of Detroit last year and has already toured or “tripped” around the state of Michigan (which is shaped like a mitten) many times. Produced, recorded, mixed, and mastered at 9th Ward Pickin' Parlor in Lawrence, Kansas by Mike West of Truckstop Honeymoon, Trippin’ references several sub-genres of rap and hip-hop, including 1980s Old School (à la Grandmaster Flash), 1990s West Coast (à la Ice Cube), and, of course, the Detroit style of the 21st century, as exemplified by Eminem. Known as much for his “eclectic” (OWTK) and “inspired” (Parenthood) choices of cover songs as he is for his original comedic story-songs, Randy parodies the Maroon 5 mega-hit “Sugar” (stripping it of its concupiscence and making it about a child’s demand for actual sugar in the form of cookies, ice cream, and candy) and expands upon The Holy Modal Rounders’ own parody of Johnny Cymbal’s “Mr. Bassman” (changing their version, whose narrator wants to be an astronaut, into a tongue-in-cheek, fearful lament about his son’s plan to join Elon Musk’s mission to colonize Mars). Randy also covers ELO’s “Jungle,” The Dead Milkmen’s “Beach Song,” and Johnny Cymbal’s original “Mr. Bassman” and enlists his wife to sing the Pete Townsend rarity “Sleeping Dog” and the Jule Styne/Leo Robin classic “Bye Bye Baby” (from the film Gentlemen Prefer Blondes, starring Marilyn Monroe). Randy and Julie’s 5-year-old son, Ryland, also joins in with background vocals on “Beach Song,” a number of interjections, and lead vocals on “Mommy Love Song” (a psychedelic ditty he wrote all by himself). Randy also covers songs by his pals Dan Bern and Mike West and changes Eleni Mandell’s Honky Tonk number “Tell Me Twice,” a song about unrequited love, to the record’s eponymous track, a song about going on a one-week tour of Michigan and missing his wife and son while he’s away. Trippin’ Round the Mitten contains the skits, dialogues, boundary-pushing original numbers (some written with his wife, Julie May) that Randy’s fans (FORKs) have come to expect of him, including “Honk Honk” (a rap about the many facets of a nose, especially a nose that cannot be squeezed due to a recent ‘procedure’), “Supernude” (about Randy’s son’s scandalizing superhero alter-ego), “Cat & Mice” (whose narrator—not Randy, of course—acts more like a brother than a father to his son, much to the consternation of his wife), and “Every Second Counts” (a musical rendition of a typically chaotic morning at the quadruple-cuckoo Kaplan household). Randy’s blend of American Roots Music and Comedic Storytelling has inspired the likes of NPR, The Nashville Blues Society, and PEOPLE magazine to name him one of the nation’s top family entertainers. As indebted to The Marx Brothers and Steve Martin as he is to Robert Johnson and Woody Guthrie, he is “offbeat, smart and funny, funny, funny!” (Mindy Thomas, SIRIUS-XM RADIO, KIDS PLACE LIVE). Randy’s recordings have won top honors from the National Parenting Publication Awards (NAPPA) and the National Association for the Education of Young Children (NAEYC). 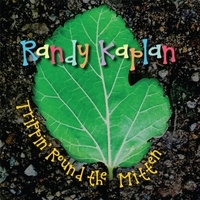 Trippin’ Round the Mitten is his sixth full-length not-JUST-for-kids CD (he has also released several MP3 singles). Randy leads songwriting workshops in elementary schools, performs throughout the country at museums, libraries, parks, zoos, theaters, and schools, and has been commissioned to write dozens of songs, including one for a stage adaptation of a Disney YA Novel and several for the Ezra Jack Keats Foundation. His songs have appeared in publications and on compilations such as LADYBUG MAGAZINE and PUTUMAYO and Randy’s latest MP3 single, “On the Phone on the Toilet,” was a smash hit on SiriusXM Kids Place Live this past spring, rising to #2 on the 13Under13 charts and remaining there for 11 weeks. Kaplan has been in constant rotation at Kids Place Live, the nation’s leading satellite radio channel for children and families, for over 10 years now, with hits such as “No Nothing,” “Don’t Fill Up On Chips,” and “Hockey Puck,” among many others! Randy has acted in theater, films, and on television shows such as Growing Pains and A Different World. He wrote and starred in a musical comedy, CLEAVE, that was staged at the Boulder International Fringe Festival, has had his poetry published in periodicals and journals such as Ugly Duckling Presse (6x6 magazine) and The Missing Slate, and has won several ASCAP awards for his work. He just never imagined that so many of his groupies would be under the age of nine! Randy lives with his wife and son in West Bloomfield, Michigan.